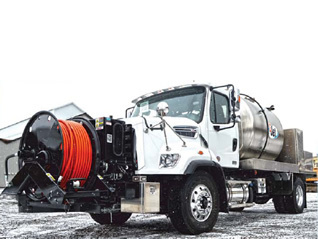 Flexible, powerful combo units from ERS could be the lowest-cost answer to your utility and municipal sewer cleaning and hydro-excavation needs. 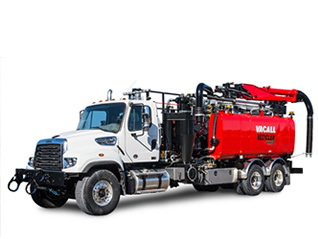 We have VACALL™ AllJetVacs and Vactor 2100s in our inventory, featuring 3600 CFM vacuum, rodders providing 80 GPM @ 2500 psi, 15-yard debris tanks and up to 1300-gallon freshwater capacity. Units include an extendable oscillating loading boom and front or rear hose reels. 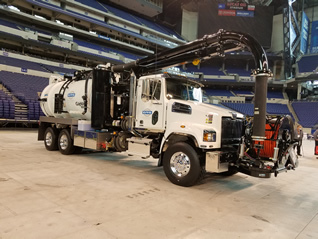 The design and controls on the Vactor 2100 sewer cleaner make it easier to operate, providing an all-around command of the work area. 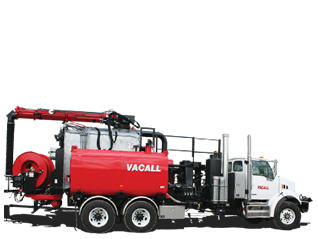 The new VACALL™ AllJetVac combination sewer cleaners provide excellent jetting action and superior vacuum power to efficiently open clogged sewer lines and perform needed maintenance. They both utilize the chassis engine as a single power source, reducing fuel consumption, emissions, routine engine service cost and downtime. Two distinct models give you a choice in feature sets to match your needs. combination sewer cleaner models use a positive displacement blower system. The vacuum and jetting systems are powered by the chassis engine, with a wide range of capacities and power options. The new AllJetVac sets the industry standard for high performance and reliability. 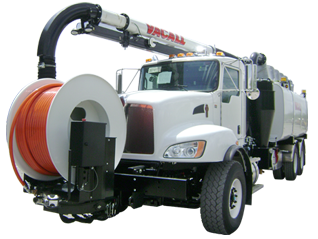 combination sewer cleaners feature a hose reel and boom system located at the rear of the chassis, rather than in the front. Exceptional performance and reliability are combined with superior operating efficiency, using the chassis engine to also power vacuum and jetting forces. allows the operator to raise the debris tank as much as 76 inches above ground level. This debris tank repositioning enables the operator to dump material into dewatering containers, avoiding the need for dangerous ramps. Jet sewer lines clear all day long without a drop of city water There’s no need to load up city water to start work, or to stop several times a day for refills. In fact, the Vacall Recycler continuous water recycling system typically uses no city water at all for jetting. The new GapVax® Combination JetVac Units, are equipped with a unitized water and debris tank and double sub-frame. Heavy-duty double acting single-lift cylinder provides a stable 50 degree dump angle. 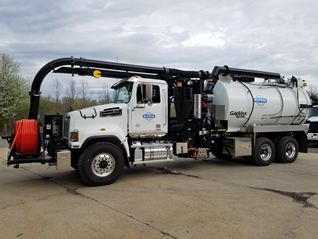 Features a 1,600 gallon stainless steel water tank, a giant GP7600 hydraulic water pump, 80 GPM @ 2000psi, and much more. Features a 3,500 CFM positive displacement pump, top loading debris tank, stainless steel water tank capacity of 500-2000 gallons and more. PDF BROCHURE 2: Click [HERE] for a downloadable PDF.